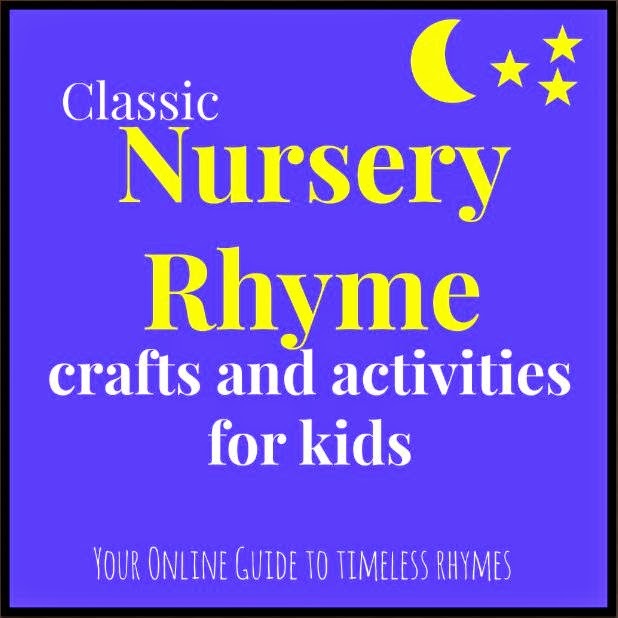 I'm excited to share our Hickory Dickory Dock craft as part of Sugar Aunts' Nursery Rhymes Crafts & Activities Series. 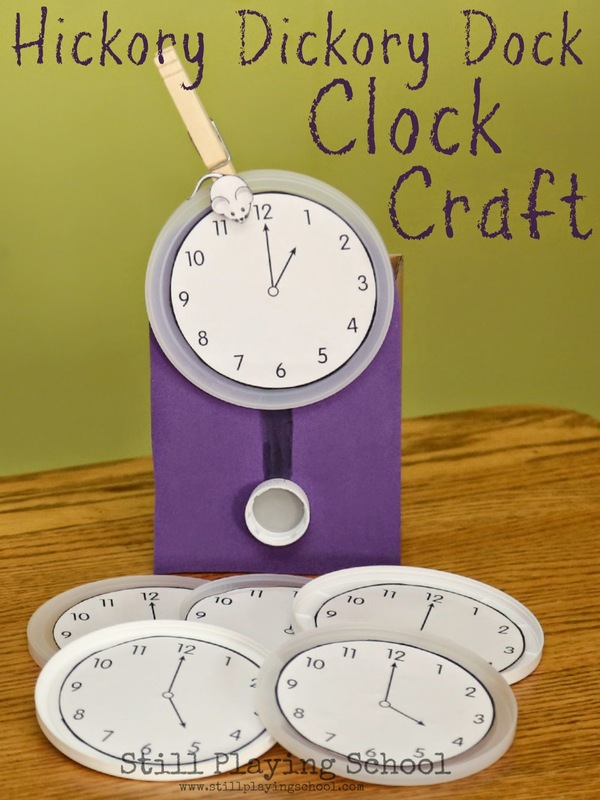 Our clock craft featured so many elements that are pivotal to the learning invitations we create: It's a fine motor activity that is created with recycled materials. It incorporates literacy and math that is adaptable to many ability levels allowing the activity to grow with your child or be available for a whole classroom of children with different ability levels. The best part is our preschooler created it and she loves it for play! Immediately when Sugar Aunts invited us to participate in the Nursery Rhyme Series we chose Hickory Dickory Dock for our rhyme. This is an inside joke at our house that I'm going to let you in on: Mr. SPS thought it was called Hickory Dickory DUCK for his whole life until I found out, laughed a bit too long, and corrected him! Gosh, he's adorable. The first step in creating our Hickory Dickory Dock retelling craft was to glue clock faces on recycled plastic lids. 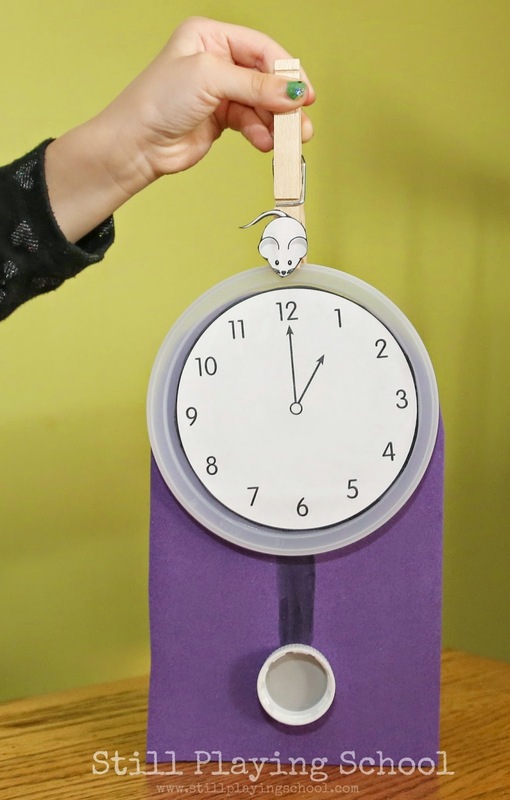 I had these clocks that tell time to the hour in my files from when I taught kindergarten but you can get your own FREE printable of the clocks and mouse we used by signing up for our weekly newsletters! Once you join our email subscribers you will receive a link to the page with all of our free printables. 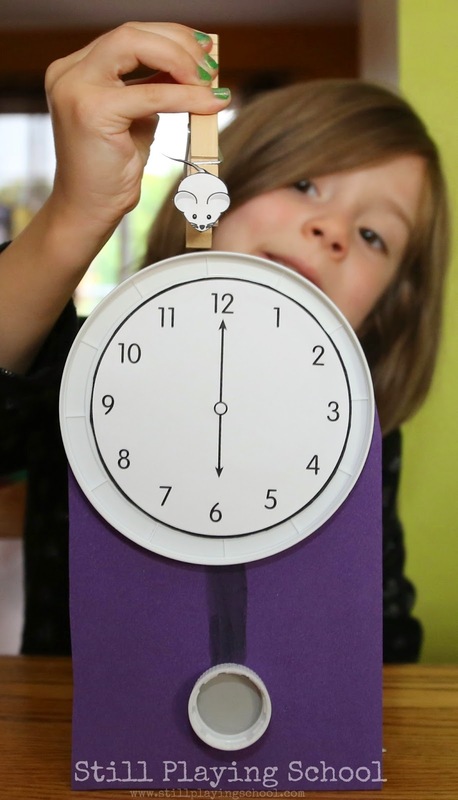 After we created the changable clock faces we glued craft foam to a cardboard box base to make the body of the clock. We added another recycled plastic lid for the clock's swinging arm though I'm not sure our preschooler has even seen a clock like this! For the final detail we glued a mouse to a clothespin so he can climb our clock as we recite the rhyme! We love to use clothespins for fine motor skill activities! 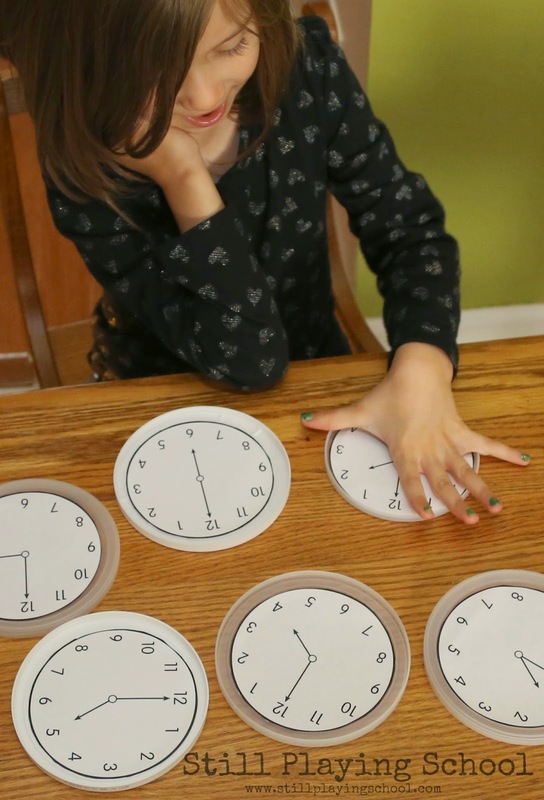 E has been working on telling time to the hour so we recited the nursery rhyme changing the hour in the poem sequentially as she replaced the clock's face with the correct time. 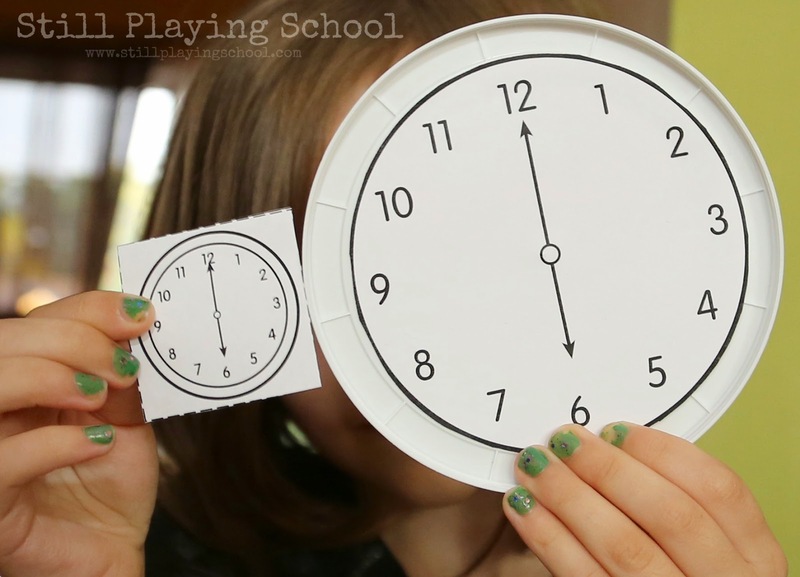 We attached and removed our plastic lid clocks with double stick tape but you could use velcro dots or sticky tak. We also had tiny versions of our clocks so we could play a game! E had to find the correct matching time and then tell me what time the clocks said. 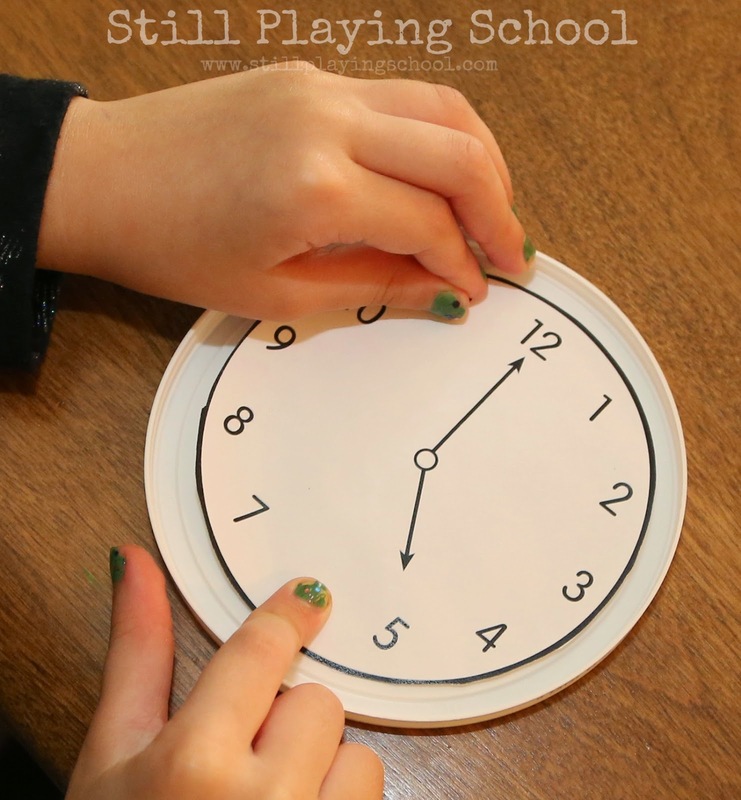 She loves learning to tell time in this hands on approach! 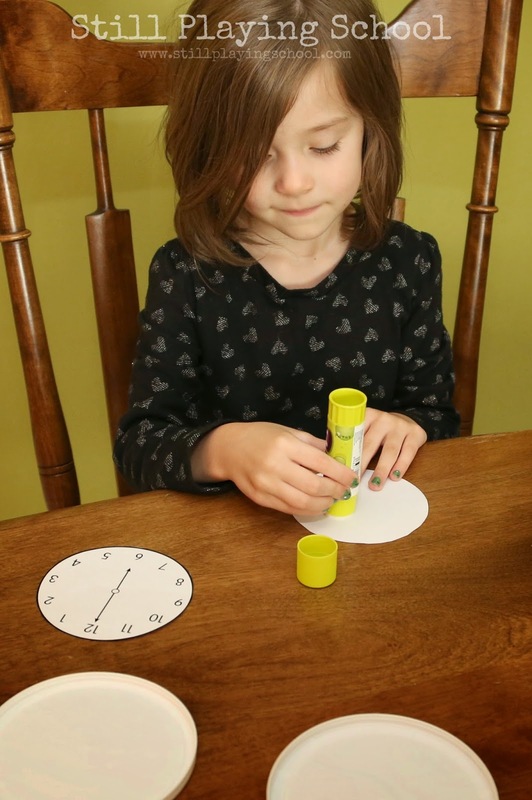 She put the corresponding clock face on our Hickory Dickory Dock clock by pressing the tape on to the foam (more fine motor skills)! Then she would squeeze the clothespin to make our mouse climb out until the clock struck and he climbed back down again!